Lock in a great price for Garden Beach Bungalows – rated 9.3 by recent guests! If you want to have a relaxing weekend and be spoilt by good people who serve good food, at an affordable rate, then this is the best place for your perfect getaway. Everything at Garden Beach Bungalows is catered to your needs!The staff was very helpful and friendly and every question and request was immediately met. I could write pages abou how much we enjoyed this place. Ulvi and his staff make your stay feel like it is home and you are family. Best family vacation we have had in a long time! The food at the restaurant is very good and at a great price. 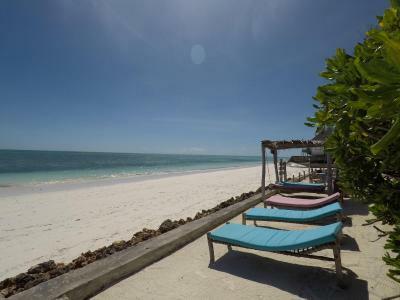 When we return to Zanzibar we will be staying at Garden Beach Bungalows! I loved this place! It is directly on the beach, with bungalows overlooking the sea and spread in a beautiful exotic garden. The atmosphere is really chilled out, intimate and familiar and perfect for people who want to be far away from crowded and mainstream beaches and prefer to be in contact with the nature and the authentic island. Besides, the owner is super friendly and always ready to respond to every special needs or give you helpful advise on possible activities. Beautiful property right on the beach. Owners and staff extremely friendly, just a lovely place . Hot showers, plenty of space to relax and enjoy the ocean front . Lots of restaurant options nearby within 5-10-15 minute walk. Highly recommend, I will go back if I get the chance! We were moved to a a very large family room. This was very comfortable and spacious. The property was very clean. The owners could not have been more accommodating to make our stay so enjoyable. The property is like something you would find beside a beautiful Caribbean beach. It is a gorgeous setting. The whole area was very safe and extremely relaxing. We were very impressed by all of the staff. Everyone was polite and friendly and very willing to be helpful- with a smile. Free wifi was great to keep in touch with family. Location was excellent!! Also the peace and quiet. Perfect if your looking for a place to chill as a couple away from noise and in front of breathtaking scenery. Food was good and many options walking distance from the property. Amazing staff, easy to deal with and prompt in arranging anything you need. absolutely LOVED this place! The family that runs it was so welcoming and accomodating, it felt like home away from home. 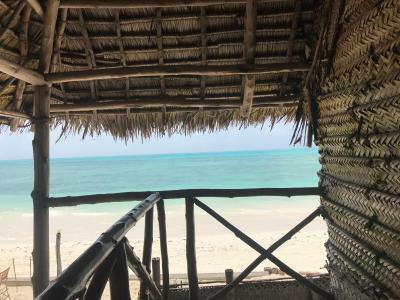 Beautiful property right on the beach with excellent common beach area full of tables, chairs, hammocks and beach beds. Adorable kitties live on the property. Excellent food and AMAZING (virgin) pina coladas. The families that own the property are very kind and welcoming, and the staff is wonderful as well. The property is right on the beach. Excellent views, really nice communal area with beds, chairs, a nice bar and on the beach restaurant area, good food (local and Turkish), extremely relaxing environment. Be sure to bring cash as there are no ATMs on this side. The transportation that the hotel offers from the airport to the hotel is a great deal-the fixed rate at the airport is double. Dala dala is much cheaper if you have time and travel skills, but beware that people at the station will try to charge you much more than the ride is worth (usually, you pay upon exiting the dala dala-it’s 2-5,000 TZS depending on if you are charged the (legal) tourist rate or not). Garden Beach Bungalows are located on a particularly lovely stretch of the Jambiani beach. The view from my room was picture-perfect. The new-ish owners are very hospitable and there's Turkish food to be had if you're looking for a change. 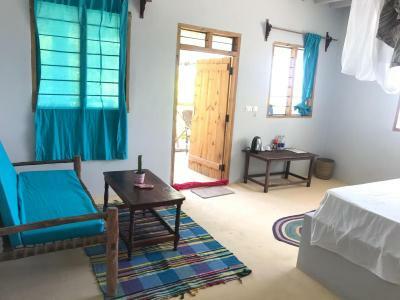 Easily (and affordably) accessible by dalla-dalla (#309) from Stone town. One of our best sellers in Jambiani! Garden Beach Bungalows is set in at the beach in Jambiani. Nungwi is 60 mi from the property. The property offers free WiFi available in public areas. Some units include a terrace and/or balcony with sea or garden views. Towels and bed linen are featured. All rooms have mosquito nets and some units have ceiling fans. Most rooms have hot water showers. Garden Beach Bungalows also includes a terrace and library. Guests can enjoy the on-site restaurant. The property has a private beach area and bike hire is available. The property has a nonalcoholic bar, the guests can provide their own alcoholic beverages and allow to drink in the property. You can engage in various activities, such as snorkeling, diving and kitesurfing. A dolphin tour, spice tour or a visit to Jozani Forest or Zala Park can be booked on request. 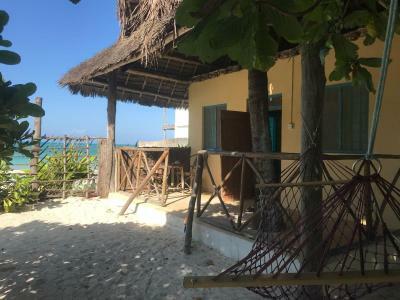 Paje is 5.6 mi from Garden Beach Bungalows, while Stone Town is 27 mi away. 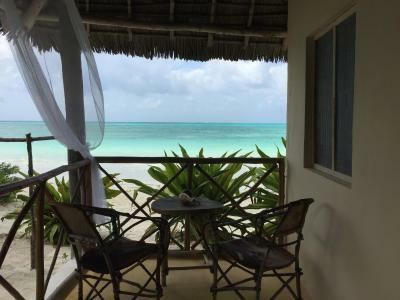 The nearest airport is Abeid Amani Karume International Airport, 36 mi from Garden Beach Bungalows. This is our guests' favorite part of Jambiani, according to independent reviews. This property also has one of the top-rated locations in Jambiani! Guests are happier about it compared to other properties in the area. 뀐 Located in the top-rated area in Jambiani, this property has an excellent location score of 9.7! When would you like to stay at Garden Beach Bungalows? This bungalow is on the upper floor and has a private entrance. 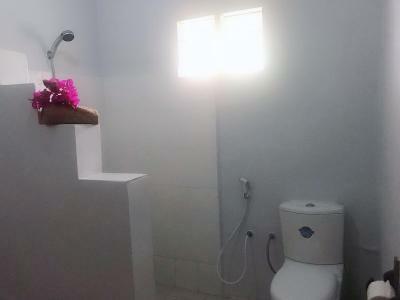 This beach front bungalow has a shared external bathroom. Please also note that this bungalow has two separated floors and this room is upstairs. There is no hot water facility in this room. Please note that this bungalow has two separated floors and this room is downstairs. Please note that the bathroom is outside of the room. House Rules Garden Beach Bungalows takes special requests – add in the next step! Garden Beach Bungalows accepts these cards and reserves the right to temporarily hold an amount prior to arrival. For bookings made with a credit card, the payment can be made through a payment link to the guest's credit card or guest. Please inform Garden Beach Bungalows of your expected arrival time in advance. You can use the Special Requests box when booking, or contact the property directly using the contact details in your confirmation. I can't say enough positive things about Garden Beach Bungalows! The facilities were adorable and perfectly situated on the beach in Jambiani, a short walk down the beach were several restaurants and adventure activities. The staff at garden beach were welcoming and accommodating, especially as we were some of the last guests before they closed for the season. The individual attention we received made us feel like we'd found a second home. The food at the restaurant was served on island time - but that never bothered us as it was apparent that it was all freshly made to order and the flavors reflected that! I highly recommend a fruit plate and a plate of rice, beans, and chicken -- we ordered it several days in a row and it was excellent every time. Breakfast included made-to-order espresso drinks, fresh fruit (the best mango I've ever eaten! ), eggs to order, and some of the most superb crepes I've ever had. The staff are more than happy to arrange transport and tours, and their accounting system made it so we didn't have to keep track of multiple expenses -- only paying the full bill at the end. We organized trips to a spice farm, Jozani national forest, and to The Rock Restaurant in Paje without any issue. They also had water shoes available to rent which came in handy while we walked the hundreds of meters of beach in Jambiani. Highly recommend to anyone looking for a quiet and incredibly relaxing getaway! Breakfast was poor, room was to small with toilet outside of the room. We change accomodation after 4 days, because this was too much overpriced. Restaurant was okay, but food bland and portions small for the price. Clean comfortable right on the beach. Bar and restaurant at beach, lots of places to sit down in the shade and relax, beach towels provided. Pretty grounds, helpful staff, everyone spoke English. Nice view from our bungalow. The perfect place to relax! We were warmly welcomed by the owner, with kindess and all the information needed. He helped us settle and organized for us tours ad tranfers. At the arrival the staff approached us with a welcoming drink and kept being friendly, smiling and willing all the time. Breakfasts were simple, tasy, fresh and home made. Lunches and dinner were well prepped and the waitress patiently explained to us the dishes we didn’t know. We really felt at home! 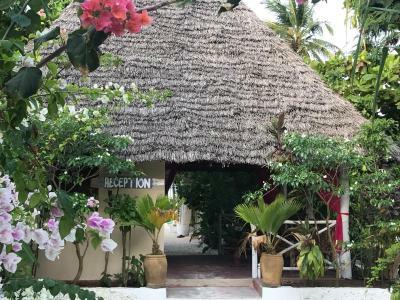 Very nice and friendly staff, good location with direct access to beach and Jambiani village, nice garden, very good breakfast, bungalow was nice, bed very confortable. Was a great time at this place. Here this is simple, easy, a little bit more typical but efficient and nice. A very good place to be ! The beach itself was a little bit disappointing. Lot of sea weeds and the sea tide was important in amplitude. I’ve expected a more beautiful place. But here you have to make a choice : most beautiful beach are crowdy. At least, you will have a lot of tranquility there. And it still possible to have a nice swim if you are willing to walk a little bit. Simple but you don’t need really more when you are in a small paradise. Rooms were equippedwith a fan and located just in front of the beach. Bathroom were also simple but everything was was very clean. The owner and the staff were really nice and helpful. Breakfast was good. Do not expect alcohol there but there are couple of nice places around to have a drink. The place is also very quiet, perfect to rest. The food at the restaurant needs to improve. During the check out when i paid the room bill by card,which was in shellings,the woman at the reception converted the amount in dollars with a non official rate which went to her favor so i ended up paying more for nothing. I should have paid the amount in shellings and let the bank apply the exchange rate. As i was in a hurry i realised too late what happend. We liked the relaxed atmosphere, the staff is super friendly. Breakfast is good, and if you ask more they bring it. The owners helped us recover my girlfriend's backpack which was left at another location on the island, they called and arrenged the taxi for a very cheap price. They have been very kind. The bungalow was very clean and comfortable. Very friendly family operated hotel. Bungalows were very comfortable with all you need. Hot shower, moskito net, great fan, tea etc. Very large room. Super quiet location (unlike what we heard from neighbour hotels).